I love getting the mail. I think I've mentioned this before.There's usually something fun hiding in there, and it's a little bit of a let down when there's not. I'm especially grateful for a new magazine, a good catalog, a letter from a friend, an ATC from my friend Pam, or a package of goods for my shop (which have been arriving daily lately). So, I went to the mailbox on Friday and what did I see? 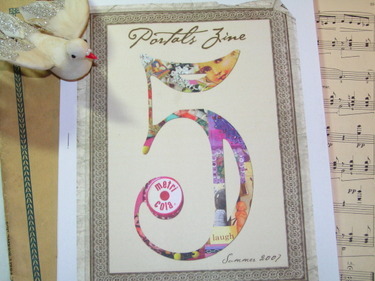 My copy of Portals Zine had arrived! Hooray! Way back in January, Heather contacted me wanting to feature my studio in issue #5 of Portals. I was (and am) so excited about the opportunity to be a part of it. When it rains, it pours, they say. First Artful Blogging, and now this happening in the same week. Needless to say, it's been pretty exciting around here with all of this happening at the same time. I thought I'd share some pictures from the article with you. These were taken in January, and my studio has since relocated to another room in the house. It looks a little different now, but it's all the same stuff. Just a little more of it....and rearranged differently. I spent forever cleaning up for this photo shoot. It looked this neat for about 1/2 day, I must be honest with you. The picture above is a crown I made a couple of years ago. My friend Lisa came to visit and we decided we needed to make crowns! She's the soldering queen, and I had just learned to solder. You can't see it too well, but the edges are all wrapped in foil tape and soldered. 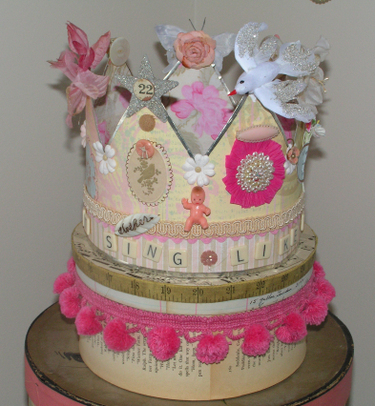 The letters wrap around the whole crown and say, "Just sing like a a bird". And below it sits a hat box that I covered with old book pages, ledger, an old tape measure and some pom pom trim. Here's a view of the sewing table and some shelves of paper. Just a snippet of this particular picture was in the article. I made the table skirt from my favorite Rachel Ashwell (from Target) curtain panel. This pattern is so pretty, and the tan background prevents it from being too precious and little-girl's-room-like. Does that make any sense? You know what I mean. So much passion and time and was put into creating this issue. I know Heather had a lot going on and pulled this off amazingly well. It turned out to be a wonderful issue with lots of inspiring art and talented contributors. If you're interested in purchasing a copy, you can get it here. It's jam packed with 53 pages of inspiration. By the way, there's still time to leave a comment on the Artful Blogging post (scroll down) to be entered into a drawing for a chance to win a free copy of the magazine. I'll close the drawing at midnight Sunday (7/22). The winner will be announced on Monday. 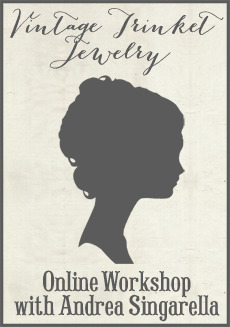 Stop back this week to see what I've been doing in preparation for the shop's big opening. Got lots in store for you! Your studio is just stunning and a work of art itself! I love your garland and all the fun things hanging from it. Great inspiration! I recently discovered your blog while blog hopping. It is a real feast for the eyes and food for the soul. Your studio is inspirational. Thanks for sharing. I'll look into Portals - I'm a magazine fanatic. It's always great to hear about a new one. Thanks! Congratulations!!!!! I love the pictures of your fun workspace. I love even more that you had to clean up for the photo shoot. That's wonderful!!! Really! You are an inpiration to all of us. Thanks for showing us your beautiful art and workroom. love love love the pom pom garland - might need to copy it! the studio is divine - mine will never look like that i am just too messy but I can live vicariously can't I ? Love the pictures of your studio & the garland. Thank you for sharing! hello wonderful pictures and i love to see what you are up to! What a lovely studio - I'm very jealous lol. Your work is gorgeous, congratulations on getting published! Love the garland!!!!!! Where did you find the the little coat hanger???? I have a photo I want to hang and would love one of those hangers!!!!! I wish i could fly at your studio and create some pretty little things with you! beautiful workspace. i love the wire dressform & baskets especially! 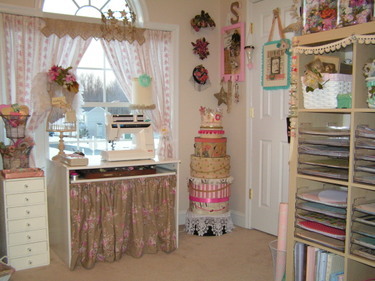 Beautiful workspace - I try but mine is in my kitchen and is a jumble at the best of times! Looking forward to your store and hope it goes very well ( and smoothly ) for you!